The Great Barrier Reef is the largest system of coral reefs worldwide and is remarkable for its unique beauty. This natural value is in the Coral Sea on the northeast coast of Australia. It is called "coral paradise of Australia, " it constitutes the largest biosistema on the planet and one of the few objects that can be seen from the open space. The Great Barrier Reef is the age of 18 million years, in this huge period approximately 3000 coral reefs, 350 coral species and 900 islands were formed. The living coral reef arises from rotation of live to dead coral formations. The accumulation of coral skeletons is derived from the already dead organisms, which grow on living. Situated on an area of 348, 698 sq. km between Cape York and the north island Lady Elliot in the south the Great Barrier Reef is the length of 2300 km and its width varies from 2 to 150 km. Over 1500 different species of fish inhabit these coral shoals, some of which are covered with exotic vegetation. Among its inhabitants are the unique whales, swallows, big green turtle, manatee and other endangered, species. In the actual area the Bandabarg tourists can see how giant sea turtles lay their eggs and bury them in the sand. The region of the Great Barrier Reef was opened up and the smallest vertebrate of life form was found living in the sea flowers. This little fish that lives around the coral reefs of lagoons, is known to scholars since 1979, but only recently found its origin and variety. This unique region of our planet is included in the list of World Heritage by UNESCO. The enormous popularity of thousands of tourists that go there annually enjoy the beautiful sea views, practice underwater scuba diving and generally enjoy this most impressive human inhabited sea area in the world. 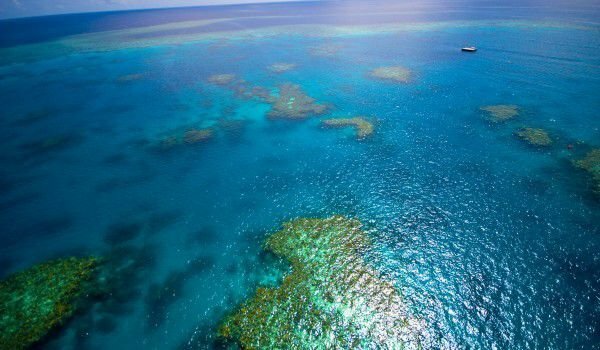 The large influx of visitors to the Great Barrier Reef keep the minds of many environmentalists watching and insisting that tourists be limited. Fishing has also been banned there.